UAVOS has announced that, in conjunction with Stratodynamics Aviation Inc., it has successfully completed the next stage of flight tests of the HiDRON unmanned aerial vehicle (UAV)-based earth observation platform at an altitude of 25 km (82,000 ft). The HiDRON carried an atmospheric measurement system onboard, in a collaboration with researchers from the University of Kentucky. The night-time flight lasted 4 hours, including the one-hour weather balloon launch period, with an average climb rate of 6.8 m/s (22 ft./s). At release altitude the HiDRON was 36 km (22 mi.) away from the launch site where it headed home and was above the launch area at an altitude of 18 km (59,000 ft.). The HiDRON then glided near the home position with a descent rate much slower than a comparable parachute-borne instrument. The return flight home lasted about 3 hours. The main objectives of the mission were flight stabilization of HiDRON after balloon release, and tuning the UAV controls and components for stratospheric flight. During the flight, operators also checked the performance of the HiDRON’s avionic systems, flight characteristics, safety features, instrument integration, and auxiliary tracking systems including a transponder. The HiDRON’s payload collected meteorological data and the atmospheric instruments were integrated with the autopilot telemetry and custom-fitted sensors. Data was collected at the ground station in real-time and compiled with the flight records. The instrument integration was also evaluated. While areas for further refinement were identified, the HiDRON and onboard measurement system performed well and demonstrated operability in high winds, cold temperatures, and low air density conditions. The obtained performance data will be used for the next stage of testing at an altitude of 30km (98,000 ft.). The high-altitude flight was conducted in collaboration with the regional Air Traffic Control Agency. Night-time flight was preferred due to the minimal impact on commercial air traffic. The HiDRON passed through commercial airspace twice, on the ascent and descent, and an adjustment to civilian aircraft routes was made during the flight window. A backup UAVOS live-linked ground station and operator were stationed at the Air Traffic Control center. This enabled the mission team and air traffic control staff to track the aircraft’s position from the ground station and onboard transponder. Air traffic control staff indicated the transponder was sufficient for subsequent flights. 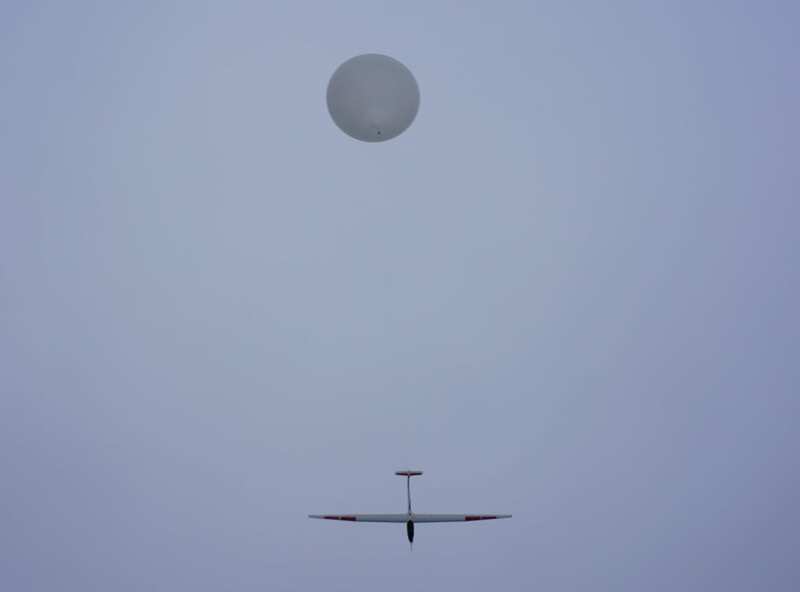 The HiDRON, a joint project of UAVOS and Stratodynamics Aviation, is a fixed-wing glider carrying meteorological equipment and launched by a stratospheric helium-filled weather balloon. With a 3.4 m wingspan, the HiDRON weighs under 5 kg and is capable of carrying an in-situ measurement instrument weighing up to 1 kg. Data from the integrated instrument is transmitted via telemetry immediately and during the ascent into the stratosphere to a ground station, much like a typical weather radiosonde. After reaching an altitude of 25 km, set by the ground station operator, the HiDRON disconnects from the balloon and glides back to the specified landing site. Changes to the flight plan can be made by the operator in real-time. To increase the flight duration, algorithms automatically process efficient flight controls to maintain optimal energy. Aircraft landing is fully automatic.